Minutes after Blake Griffin informed the Los Angeles Clippers he was opting out of the final year of his contract on Friday, Chris Paul did the same. The reason for their choices is simple. Both players signed max contracts under the old CBA, and the recent influx of cash via the NBA’s new television deals means they can sign much wealthier contracts by opting out this summer. As the president of the players’ association, CP3 was a big part of negotiating for the right of older players such as himself to remain eligible for so-called “super-max” contracts. Such a deal would pay Paul upwards of $200 million over five years, while any other team can offer a maximum of four years at approximately $150 million. Paul would have to give up quite a bit in potential earnings to abandon the Clippers. On the other hand, his letdown to reach the conference finals, let alone the NBA Finals, defines his career ever further with each season. Paul could decide that money isn’t worth giving up on a ring — or passing on an opportunity for a fresh start with teammates who enjoy his company. Here are the five teams that could make a play for Paul this offseason. Even though Phil Jackson has become an expert at alienating his stars, and both Carmelo Anthony and Kristaps Porzingis could be gone soon, he would like the chance to play in the Big Apple. Chances are short, but the Knicks are still going to try. Back in the day he, DeMarcus Cousins, and Anthony Davis would form a scary Big Three. Paul’s arrival to the Pelicans would help guarantee that Boogie re-signs with New Orleans next summer. However, the Pels are a few years away from becoming a real title contender even with CP3 in town. They’d still need shooting and a coaching upgrade, perhaps. More importantly, they’d have to contend with that superteam by the Bay in Oakland. James Harden just had the best season of his career playing point guard for Mike D’Antoni, and the Rockets reportedly would love to sign Paul as a free agent. There is caveat here though: Houston would need to clear a ton of cap space to sign a max-contract superstar, as is the case with the Rockets’ reported interest in Blake Griffin as well. If this is the case, it could be the precursor to a San Antonio superteam. Let’s say CP3 joins up with Kawhi Leonard and Gregg Popovich this offseason, spending the 2017-18 campaign acquainting himself with Pop’s schemes. When LaMarcus Aldridge becomes a free agent in the summer of 2018, the Spurs let him go, make a few moves to clear some more space, then sign LeBron James as he flees Cleveland for the safe harbor of a stable organization. 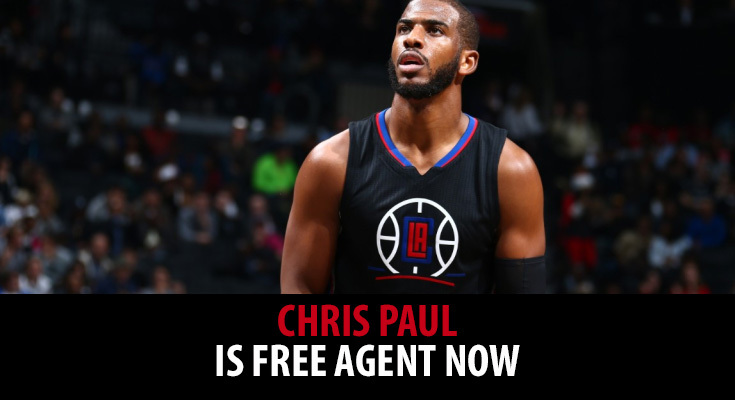 This may be the only way Paul leaving the Clippers to make sense. None of his other options get him any closer to an NBA Finals better than he is with Los Angeles. Stability, a whole lot of money. Jerry West. LA. The Clippers can offer all this and more to the best player in franchise history. The question is whether it will be enough. However, the forecast here is that CP3 is going to the Clippers for next season. With all the chaos in the NBA these days, though, anything can happen. Sign up at WagerWeb.ag.